For the third night in a row, we have the glamour tie of one of the Copa America’s groups. This time we head to Group B for Mano Menezes’ Brazil against Gerardo Martino’s Paraguay. To some extent, it was a rather predictable clash. Brazil are playing a patient passing game under Menezes but have often looked toothless, while Paraguay are an unspectacular but well-organised side. Everything was set up for a basic defence versus attack match and that’s partly what we got. Paraguay set up in the same 4-4-2 they used against Ecuador, defending fairly deep but pressing intensely on a man-by-man basis. Roque Santa Cruz played even deeper than he had previously, often dropping into the midfield with Nestor Ortigoza moving into a more clearly defined holding role to make a 4-1-4-1. Brazil continued with their 4-2-3-1 and passing style, with Jadson replacing Robinho on the right. The only real difference for them from their game against Venezuela was that the attackers were more willing to defend, – not that they were particularly good at it, Dario Veron proving so shortly before half-time by throwing Neymar to the ground, but the intent was there, which would have caused Paraguay more difficulty than if they hadn’t. Paraguay had looked the better, more dangerous side for most of the first half. Brazil controlled possession yet struggled to create anything, often looking completely outnumbered by the Paraguayans. The tricky Neymar looked Brazil’s best bet, his dribbling causing some issues for Veron, but the defender mostly did a good job against the youngster. Andre Santos seemed reluctant to overlap him down the left, instead playing very narrow as if he was an extra defensive midfielder in possession, leaving Neymar with little in the way of an out ball. With Brazil having to push men forward to give themselves a chance of getting a goal, they were left susceptible to Paraguayan attacks, particularly from Marcelo Estigarribia, who took advantage of Dani Alve’s forays forward to great effect. Yet it was Brazil who made the breakthrough. Despite being a fairly patient build-up, Jadson’s opener came on the counter.After losing the ball up the pitch, Paraguay managed to get people back but were too focused on trying to end the Brazilian attack to get back into their shape, leaving Jadson free for a precise shot from the edge of the box. 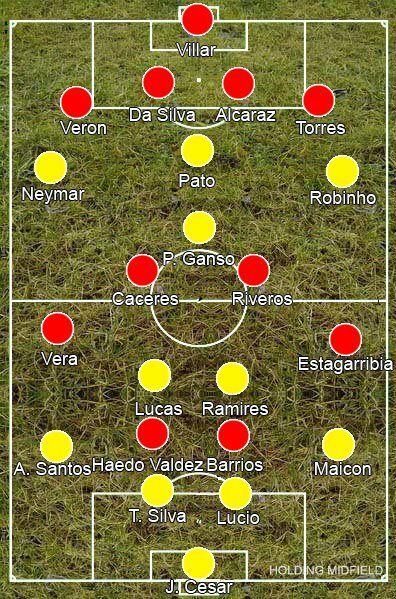 A goal up, Brazil should have had, in theory, a fairly comfortable second half against the counter-attacking Paraguayans now they did not need to attack – switching to a Dunga’s more defensive lopsided 4-2-3-1 formation with the introduction of Elano for Jadson. They did not, however, have a comfortable time. Once again, that man Estigarribia escaped Dani Alves and outpaced Ramires to slide a pass across for Santa Cruz to finish. He then repeated the trick by punishing some awful blocking by Dani Alves, giving it to Santa Cruz to set up Nelson Haedo Valdez. A goal up, the tables had turned. It was now up to the unthreatening Brazil to attack, while Paraguay could look to cancel them out with their well-organised defence. Brazil introduced the more attacking Lucas Moura for Ramires, then brought on striker Fred for Neymar, but they still couldn’t threaten the Paraguayans until a lapse in concentration by the defenders, and admittedly some quick thinking from Fred, allowed the substitute to get a shot away. As is becoming a familiar feeling during this Copa America, we come away from the match with nothing new learnt: Brazil continue to disappoint, and Paraguay are well-organised but not quite possessing the high quality in attack of some of the other sides. Estigarribia roasted Dani Alves throughout the match.Paraguay could have done with a little more of penetration from the center of the pitch.Almost all of their attacks came from the flanks.